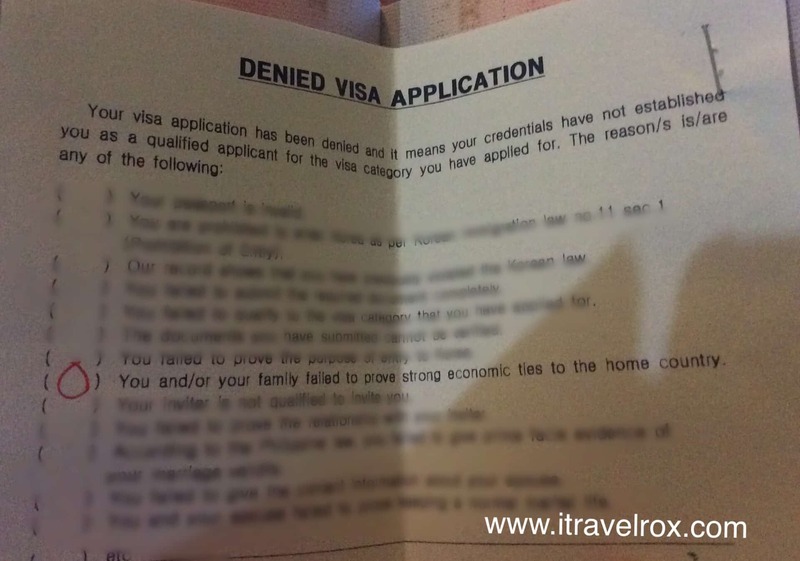 I’ll share my experience about this South Korea Visa Denial. You read it right, I’m sharing with you my South Korean visa denied story. It was May 2016 when I booked a promo flight to South Korea. I was waiting for this because I wanted to experience winter in South Korea which is just a 4-5 hours flight from Cebu. On January 25, 2017, I went to the Consulate of the Republic of Korea in Cebu. My scheduled trip is from February 15 to 22, 2017. Original Personal Bank Certificate (must include account type, current balance, account opening date, ADB), a bank certificate for visa is a must at least PHP 50,000. Certificate of Work Contract as I am an independent contractor. I received an email on January 30, 2017, that I was advised to submit two (2) guaranty letters. A letter must be submitted together with Guarantor’s Passport bio-page copy (if available), a Photocopy of the Guarantor’s government office ID (for government officer guarantor) or company ID (for company guarantor), front and back. What Went Wrong – South Korea Visa Denial? (c) the guarantor shoulders the expenses arising from the applicant’s stay or detention in Korea if he/she is unable to pay them. I don’t have any companions to/in Korea as I mentioned again and again that I am a solo traveler. Since I’ll be traveling solo, maybe the embassy thought that I would illegally stay in South Korea and look for a job which I don’t have a plan. My only ultimate goal is to experience winter. Remember my Denied Canada Visa Application? It was also my chance to experience winter last January 2015, but it never happened. No more winter experience for me. My affiliation with a non-profit organization I am involved with is not considered a strong economic tie to the home country. As a Filipino traveler, you might ask where I’ve been. So yeah, I’ve been to Five Countries in 2015 including Japan and Taiwan. But then, wherever I’ve been to, it’s useless. Sad. Well, maybe South Korea doesn’t need Filipino tourists because of the stricter rules of visa requirements. Perhaps, I’ll just say goodbye to my wasted ticket to South Korea, will never experience snow and maybe avoid to visit this country for now. Well, I am heartbroken since this trip to South Korea is a gift to myself for a solo traveler like me. I’ll just shave ice and eat halo-halo instead. Somehow, I was able to Go to Boracay – Moving on from a Failed Winter Trip. Check out the comments below as you can also read other people sharing their South Korean visa denied stories. So, for my future references, I found a list of accredited travel agencies for South Korea visa application. Hope this will help you as well. Rm 32-34 Colegio Business Center, Nueva Segovia St.
LG8 Cityland 10 Tower 1 H.V. Dela Costa St.
COME ON PHILS. Golf and Travel Agency Inc.
Room 301 Trans-Asia Bldg., Osmena Blvd., Cor., M. J. Cuenco Ave.
Party-on Travel and Tour Community, Inc.
Unit C2 17th Flr., Strata 100 Bldg., F. Ortigas Jr.
4F Lucky Chinatown, Reina Regonte St. corner Dela Reina St.
Sen. Gil Puyat Ave.& Dela Costa Sts. Unit LG 3, 4 & 14, 146 Alfaro Place, L.P. Leviste St.
3rd Floor 331 Building, Sen. Gil Puyat Ave. This entry was posted in Visa and tagged Denied South Korea Visa, South Korea Visa, South Korea Visa Denial, South Korea Visa Denied, South Korea Visa Refusal, South Korean Visa Denied, South Korean Visa Denied Stories, visa. Bookmark the permalink. Hi. Ask ko lang. Okay lang kaya mag submit ng newly opened account bank cert. Kaka 3 months lang ng bank acct ko nung Feb 7, 2018. Actually kasi, tinransfer ko lang ung bank account ko from aub to bdo, kaya bagong bago ung account. And I’m planning to submit an explanation letter na sinasabing i just transferred funds. Coconsider kaya nila yun? Do you have other source of income and funds po? Currently employed lang sa bank. Sooo yun. Banker po ako. Just mention you work at a bank. Hi!planning on a trip pero yung binigay ng company na ITR(2017) has no stamp unlike last year.sabi ng HR un lang daw binigay ng BIR sa company.and a bir staff said daw na its not neccessarily needed na kasi may bago daw sila memo etc. I don’t know if it was a mistake or misunderstanding ng HR/BIR. Un din talaga fear ko kc baka isipin nila it was just made up,thou nakalagay sa 2316,ung payment and signed by the president of the company i work for. Parang ITR’s are so hard to get. Sa gustong magpa assist ng Korean Visa, please pm me sa facebook Lucel Yves.I work in Korean travel agency sa Cebu. Sa mga na denied and gusto mag appeal, please pm nyo rin ako. Based on my experience okay lng po na wlang stamp ng BIR. We applied din last Feb 8 w/o BIR stamps approved naman po visa namin. (It’s our first time travelling abroad) Im sure nag-ve-verify din sila sa BIR bsta make sure lng may TIN # indicated da form. Hello. I just got my visa denied 🙁 Now, I am trying to appeal it to Consul. First time traveler din ako and i dunno bakit na-denied ang visa ko. I am pretty sure naman na yung laman ng bank ko is sufficient. Pero How much ang required amount? Any idea? First time traveler ka, I got denied even though I was in Japan and other Asian countries already. Wala pong reason na binigay kung bakit? May kilala naman po ako first time traveler na na approve. Hi, I’m planning to go to Korea this April and planning to apply visa this march. I am worried because I will use separate bank account. I mean, I open and account for my travel to Korea, and it’s 6 months already. Is that okay? my friends are using payroll accounts. hi na approve po ba visa mo? Please show bank statement or bank cert. Yong iba Wala daw BIR stamp. Clarify ko lng, bank certificate alone and no bank statement is ok? Mam takong lang…yung kapatid ko kasi denied din…pwede kaya sya agad sa other country katulad ng uae…di kaya mkwestyon yung sa korea nya? Hi! Me and my friends are planning to go to SK this april but the ITR that was given to us by the HR has no BIR stamp, will that be ok? Also, do we need to submit bank statement or a bank certificate only is ok? So no need to submit bank statement? Just bank certificate? Thank you! Pwede both but I important is the bank certificate. All you have to do is to wait on March 12 po. Na approve po kayo Ma’am rachel? Approved po ba visa nyo? Last year during autumn I have applied for SK visa na 20k plus lang ang laman sa bank ko but I got approved! Sa application form nilagay ko 3 days lang ang stay ko. Nagpasa po kayo ng Bank statement na covering the last 3months po? May I ask kung ano yung ADB mo? And how old was your bank account then? Thanks! hi ilan po kayong nag apply and na approved po ba? Hi ilang days po dineclare nyo? Approve po ba kau? hi na approved ka po ba? Hello po, ask ko lang po kasi sponsored po ako at niece ko ng sister ko pag nag travel kami sa korea this May, do I have to request multiple copies of documents like COE, Bank Cert, Bank Statement and etc? we are planning to apply for a visa as a family po. Better you prepare some documents po. Good luck! Thank you for your reply, Miss Roxanne. One more thing, (If you have an idea lang naman po) kasi yung niece ko may used Oecd visa na siya tapos ako wala pa since visa-free countries pa lang po napupuntahan ko, paano po yung sa pagpasa sa window ng requirements? magkaiba parin po ba or same parin since family application po kami? Sorry, I really don”y have an idea kasi paano kapag family application ng korean visa and tried asking friends also pero walang mga reply. Just apply as family po and submit in the same window. Hello. How’s your application for korean visa? Approved po ba kayo lahat. Same case kasi tayo. Worried ako. Ako kasi mgsponsor sa sister ko at sa cousin ko. I’ll be using my payroll account for mu bank cert kaso di daw nila malalagay ung ADB since payroll account sya and may standard template na daw sila. Okay lang po kaya un? Thanks. You can ask a bank certificate and bank statement containing the ADB po. Thanks. ilang days po binigay ng consulate para dun sa follow up requirements?? via email po ba pagsend nyo ng requirements? Thru the consulate 5-7 working days. after nyo po mgpasa ng add. req.. ilang days po ung result?? Ask ko lang na-approved ba visa mo?How many days ang waiting time? Same here, Embassy asked us to send additional documents. Much better if 6 months na. Hi,ask ko lang kasi nag apply kame ng anak ko ng korean visa, nagwowork ako kaya lang hindi pa ko nakakuha ng employment cert and itr, ang ginamit ko yung sa mr ko as housewife, kaso hindi nila tinanggap yung employers cert kasi walang nakalagay na compensation, pero me dala akong bank statement ok nman yung savings ko, at meron din ako affidavit of financial support galing sa anak ko sa Canada, ibinalik nila yung documents pinalalagyan lang ng salary compensation,wala naman binigay sakin ng denied slip, pwede kaya ako ulit mag apply gamit na yung my my own documents like employers cert and itr form. Balak ko bumalik next week. Yes apply ka ulit with the salary compensation. Wag mo nang Pilitin po. Hello, got same experience po. Kakakuha ko lang today and ayun denied </3 but may nabasa ako na pwede daw mag-appeal. Eto sinusubukan ko ngayon. How was ur appeal po? Have you submitted 2316 po? Hi Michelle! Financial Advisor din ako, ask ko lang, dun ba sa COE mo merong naka indicate na salary? I hope you’ll notice this. Thank you. Ask ko lang po kung may sapat na budget naman para sa korea trip for newly weds, accept kaya Nila kahit walang bank account, ITR.. Pero gagawa nalang ako ng Cover letter.. Sariling ipon kasi namin yun..
Hello, just write on your cover letter that this is for your honeymoon. hi! I will be applying for Korean visa next week pero natatakot ako kasi i do not have ITR since I am unemployed. Bank cert, previous travel to visa-free country and letter of explanation lang yung bala ko 🙁 kakakaba! ask ko lang po if you have any idea what will they consider as strong ties dito sa Philippines? Thank you! A job or properties you have in PH like land, car, house and lot. Hi, Good afternoon po! I will be applying for a Korean Visa Next month po by June, kaso nagwoworry po ako if madedeny ako or maaprove kasi first time ko pong nag apply for a tourist visa. Before po nakapag travel na ako sa Europe pero fiance visa po yun, and way back 2012 po yun to 2013. Now po i have a regular job as an ecommerce assistant australian company for 1 year na po by this june. I will be using my payroll account/savings account for applying! And i will be traveling alone and planning to visit korea for 5 days! Please help naman po ng mga suggestions. 🙁 Im so worried! Yes i have already an ITR given to us this January! And for the bank certificate i will deposit this month and also for the next month for the money i will be using for my travel, because i am using only a payroll account which also was informed to me that can also be a savings account. Use your payroll account as long as it has lots of money. What i actually do is that every month of my salary i withdraw all of it getting scared my ATM will have a problem and charge me without my consent. I think most of my workmates do that! So I guess I don’t have a withstanding daily balance as they say! Hmm important you have much money in your bank account but you can try. 50k at least. Would you suggest i should book for the flight and hotel or wait for the visa first just in case? Hello! I would just like to share my experience with getting a SK Visa. My father and I applied for a visa. I am currently employed while he is a senior citizen. I have only 60k in bank and he has 40k. We processed them though agency here in Davao, particularly in Rakso Davao. He only showed his senior citizen ID and COE for me. the Embassy required an additional requirement which is the alphalist of BIR form 1604E along with the BIR from 2316 for employees. I requested mine to our HR but unfortunately, they did not provided me with the BIR form instead, just an excel file with only my name including a separate appendix for the BIR stamp. the agency advised me to write an explanation letter for the alphalist. and it worked! I got mine approved and for my dad too! I declared 3 days only tho I will be staying for 5 days. it won’t matter as long as your balance in your bank account exceeds your declared travel costs. This is my second time to get approved. my first one, I declared USD 600 for 3 days. bank account balance is 70k. then the second one is the same declaration but with only 60k in bank. My only real money is like 30k only so what I do, I borrow money from family and friends then after I got approved, I just returned it. and also, you could check booking.com for hotels/guesthouses to where you will stay in korea. they needed an address and a contact number to where you will be staying in korea so I would recommend in booking.com you don’t need to pay for it. you can just book it then pay at the property so you can cancel it if you don’t feel like staying there. I chose namsan guesthouse 2.. perfect for travelers and they got free breakfast and at such affordable price. like 2700 for 3 days 2 nights. Thank you very much for the info its very helpful! and by the way what about the plane ticket you haven’t yet booked it without the visa right? I was thinking of declaring to stay for 5 days but I might as well try the 3 days, the one that you said. just put it for 3 days for conservatism. they will give you 59days stay anyways when you got approved. and for travel costs, budget it 10k per day as long as your bank balance is more than your declared travel cost. other said they budgeted 25k for a 3-day trip. I am an auditor. I don’t really make much tho. haha..As long as you have completed your requirements, you would be fine. if not, an explanation letter can save you too! Hi Prey. I will be using my payroll account sa bpi. Ang kaso every sahod winiwidraw ko lahat walang natitira. Ok lang kaya kung ibalik ko ung mga winidraw ko sa isang deposit lang? Hindi po kaya questionable un? Thank you sana mapansin mo po. it is okay. it is nice to share experiences too! we all love korea..haha.. actually booking a plane ticket before going to apply for a visa is unnecessary. when I got mine on the first try, I did not book yet since im also same as you, paranoid I might not be approved. as long as you have the requirements you will be fine. also, a lot of people advise to have atleast 50k in bank account, that would be the conservative balance esp us who do not earn much. just don’t put a lot of money in your bank for the sake of getting a higher balance since they will also check your monthly salary too written in your COE and ITR. also any dates will do. as long as it is within your planned date of travel. And don’t worry, they wont ask you when you will be back. Your COE, proof of your employment will let them know you got a job waiting for you to go back here in PH. 🙂 and regarding the bank balance, ADB must be 6 months. So I started saving and putting money by batches, say 10k per month. to reach 50k. don’t put 50k in one deposit only and if your salary say, only 15k a month, they will raise questions on the consul. that is the reason why they required ADB. to know if you can personally afford your trip or you just borrow money for visa purposes only. so I advise if you wanna go somewhere, plan ahead especially for those countries with visas. hope this helps!! Yes, it does help! I will be using my payroll/saving account! And it is active for 11 months now! Actually in regards for my bank before im actually keeping my money inside but there was news that there might be a leaked on the ATM so I got scared so everytime I got the monthly salary I withdraw all of it starting late last year. I will actually deposit half of my money this week and the rest of next month! Because I am planning to apply June 16 next month! Thanks Prey for answering and giving us your knowledge about South Korea visa. Hi Shaira! How’s your SoKor visa application? Hi! My student is inviting me to go to Korea. Their parents will be sponsoring my trip including round trip airfare, food and accommodation and other expenses that I need during my stay there. I plan to stay there for 5 days. My question is, is this an advantage for my Visa getting approved? They are doing this as a sign of gratitude for being their children’s tutor in the last 6 months. As long as they will show all the documents required as they will sponsor you. Hello. Me and my friends are planning to go to korea next month How early do i have to be when processing visa in cebu? Do i have to be there at dawn? Pls rply. Thank u.
Hello good day! Ang dami ko pong nakukuhang ideas sa mga shineshare nyo.. my sister and I are planning to go to korea sa Jan. And Im a fresh grad and im about to start working na po, but the problem is, wala po akong ITR since walang tax yung salary ko, around 8k lang po, so nabasa parang I need to write a letter about my reason na bakit wala ako ITR. And one thing, ano po yung sa Alpha list? Medyo confusing lang po.. Salamat po sainyo! Alphalist doon nakalagay lahat name ng mga employees na nagwowork sa company detailing their salary every month and also their taxes. Usually hindi binibigay ng Employer yun kasi confidential, yun ang nangyare skn pero gumwa ng explanation letter company ko kung bakit and also they provided me the BIR transmital confirmation na sinubmit nila sa BIR and my name only together with my TIN. Hope this helps, i will be apply this coming july first week nireready ko nlng mga requirements. So parang mainit ang dugo ng taga cebu embassy saakin..kahit galing nako ng korea last year..kala ko mas mabilis pero mas naging mahigpit sila.so ginawa ko pumunta ako ng manila doon ulit ako nag apply ng visa,di ako sumuko kahit pagod at gastos ko..imagine cebu ,hotel at plabe ticket back in port sa cagayan de oro.hmm so yung di ako sumuko apply ako manila,sad to say denied na daw talaga visa ko dahil 2 times na may record ng denial sa cebu..
Hmm but wait,tinawagan nila jowa ko sa korea huminge sila ng reference na handwriting na invitation..thanks god 3 days approved..wag po kau mawalan ng pag asa..
Kahit pala may invitation pag wla kang trabaho i dedenied talaga nila..laban lang..
Hi ask ko lang kung yung sa Bank statement kailangan ba savings account type of pwede na yung ATM type? Hi, I applied for an invitation in sk, it has been paid for, since over a month now, and the program is coming up this month end. The company has not sent me invitation till date. Please what do i do. Thanks. Please I seriously need help here. I am Melvin Collins from Monrovia Liberia. My Country to south Korea is Visa upon arrival. I was denied visa at Incheon Airport in may 2018 while going for Church conference and I had to return the next day because I couldn’t attend the conference without visa. Now I have been offered a scholarship for undergraduate program to study in South Korea but I don’t know how long it is supposed to take me before I can go back to Korea after being denied entry into Korea. I am hearing people saying it is going to take five years before I can go back. Please I need to know before I can take decision as to go or not. Hi about 1 week ka sa korea ? For the first time international, but Ok nmn lhat ng docs ko.pero di pa ako ngttravel abroad if ever first time ko tapos sa visa country pa. Is it ok? You can try naman po or better put 5 days lang. Hi! I hope you can answer my question. Im applying for an SK visa this january unfortunately my form 2316 for year 2018 is not yet released by the company by then. Would it be ok to submit mu 2316 for 2017? Hi, it’s ok to submit that then submit the Certificate of Employment. Thanks. Are there any cases that the embassy or consul of south korea does not contact the employer for verification but still grants you a visa? Please share. I have no idea because usually, they call your employer. That’s what I’ve heard from someone. She got denied just because the HR officer wasn’t able to take the call. Maybe some people can share their experiences here. Do the embassy confirm your ITR with BIR and your COE from your employer? They will call your employer just to confirm that you are working for them.